RTÉ BROADCAST JOURNALIST Marian Richardson has signed off on her last episode of Playback today, ahead of her departure from RTÉ next Thursday. Richardson has presented Bosco, worked on Morning Ireland and the News at One, and spent time as the producer of Today with Pat Kenny and Drivetime. A huge number of people shared their praise of the broadcaster on Twitter after Richardson’s last edition of Playback was aired today. Among those who praised her were her colleagues from RTÉ: presenters Mary Wilson and Rachael English; and reporters Liam Geraghty and Juliette Gash. The amazing #MarianRichardson @mariansaskia broadcasts her final #Playback on @RTERadio1 this morning. One of the great voices on the airwaves, smart, insightful, thoughtful and funny, she will be hugely missed. Ronan Kelly and Sinéad Mooney will take over and alternate as Playback’s producer-presenters from next week. “Well whether it’s winter time, or summer time, it’s time to go time, and I never even mentioned Brexit,” asking listeners to stay tuned in for Richard Curran’s The Business, which airs straight after Playback at 10am. As for me, I’m leaving RTÉ next Thursday, 40 of the most fulfilling years of my life were spent here working as a broadcast journalist across radio and television. Public service broadcast journalism at its best, and it was often at its best, is a glorious thing. So thank you for listening. 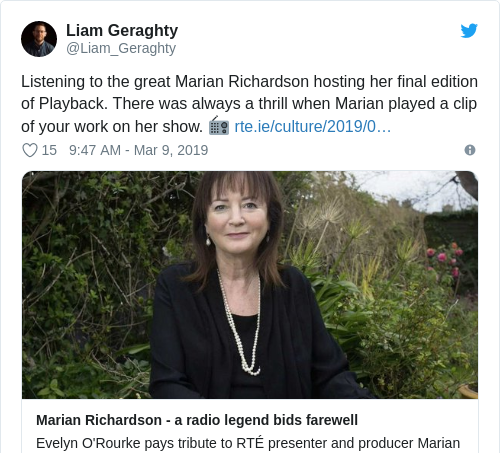 Email “'A true broadcasting legend': Marian Richardson bids farewell to RTÉ”. Feedback on “'A true broadcasting legend': Marian Richardson bids farewell to RTÉ”.